we endlessly watch footage of seemingly hopeless, hapless immigrants in unseaworthy boats often jumping into the sea before swarming up netting to safety and safe passage to the EU – either Italy or Greece or various small islands. We see overcrowded rubber dingies and rusting hulks at the start of the news only to be shown Naval and other specialist ships with their deks invisible under the latest load of passengers to be ferried into EUrope. It seems fairly clear to me that what started out as apparently a humanitarian mission has turned into a well orchestrated ferry service, surely if this farce is to continue, with organised migrant agents providing passage on vessels neither fueled nor viable for a 200 mile journey across the Med which can prove sqully and tempramental with waves well able to swamp many of the travel agents’ boats – it seems these travel agents provide a platform designed to sit just off the coast and await the the ever attentive ferries provided by the EU, Governments and the NGOs who are cashing in on this lucrative market. Morally just what is the difference between the North African travel agents, who the media and politicians choose to brand as people traffickers and the ferry crews that carry the passengers to their desired destination? Having murdered Gaddaffi and destroyed the stability that was in Libya during his term in power SEE: CLICK HERE also HERE even Barack Obama said “Libya was the worste mistake of my Presidency” CLICK HERE the EU would seem utterly incapable of managing the inflow of migrants, I guess we just add that to the ever growing list of EU failures as it permits waves of immigrants in to dilute the national feelings of the unfortunates it is pretyending it can force into a one size fits all surrender of values, cultures, languages and national self respect! When does a rescue mission turn into a ferry service? 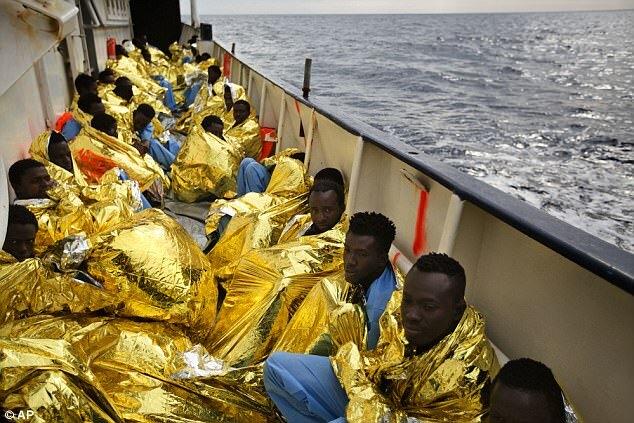 Something very strange is happening in the Mediterranean this spring, as the migration season gets into gear and we brace ourselves for another summer of migrants being plucked from sinking rust-buckets or being washed up dead on Italian and Greek shores. Right under the noses of the Italian authorities and the EU border agency, Frontex, a charitable ‘ferry service’ has been launched, with shiny new boats and sympathetic staff allegedly colluding with the people smugglers controlling the migrant trade. 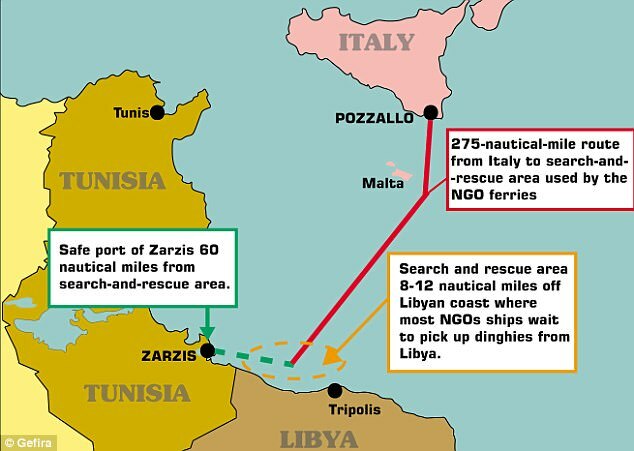 A ferry service from Libya to Italy — direct — provided by private NGO ‘rescue boats’ which have about as much to do with rescue as I have with diplomacy. The Italian Parliament is aware of this apparent collusion. At a hearing in March its President Laura Ravetto raised a question about the ‘excessive collaboration’ between NGOs and migrant smugglers. She said the allegation of apparent collusion had been raised in two internal reports by Frontex. 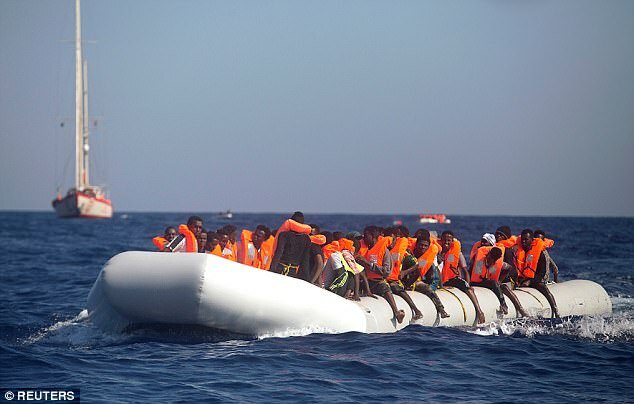 One of the reports said immigrants leaving North Africa had been given information in advance the route to follow to be picked up by a NGO boats. The other report said there was a recorded case of criminal gangs taking migrants directly to an NGO boat. The impact of this ‘ferry service’ is alarming. The Italian coastguard estimated the number of migrants arriving in Europe just over the weekend was 8,000 – many of whom were passengers on — sorry, rescued by — these boats run by NGOs. 8,000 migrants last weekend is in addition to the 33,000 who have made it across so far in 2017, according to the International Organisation for Migration. 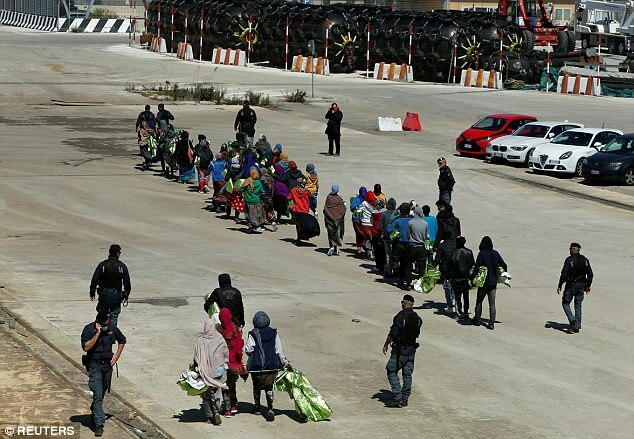 A well connected source close to the EU’s anti-trafficking Operation Sophia spoke exclusively to MailOnline to confirm that migrants are being put out to sea in the knowledge that private NGO ships will ‘recover’ them and bring them to Italy. Unsurprisingly these NGO ‘ferries’ are on the increase. There are now dozens of them. A veritable Armada of small and not-so-small ships waiting to bring in the migrants leaving North Africa. ‘It’s difficult to keep track of them and really know what is going on,’ said the source. ‘NGO boats hang around just outside Libyan waters and sometimes even go into Libyan waters. ‘It used to be that a migrant would contact the Italian Coast Guard via satellite phone. But now they are contacting the NGOs directly, often in advance, advising them there is a boat in distress. ‘The NGOs seem to know the specific area where migrant ships will be stranded. So there has to be contact between the smugglers and the NGOs. The team at gefira.org, who investigate geopolitical events for investors, claim to have proof that this is happening. On the evening of 12 October 2016 at 21:15, 113 migrants were ‘rescued’ 8.5 nautical miles off the coast of Libya by four NGO ships: the Phoenix, the Astral, the Luventa and the Golfo Azzurro. Earlier that same day, following contact from a a migrant boat operator, the Italian coastguard informed the Golfo Azzurro about the coming ‘rescue’ operation. 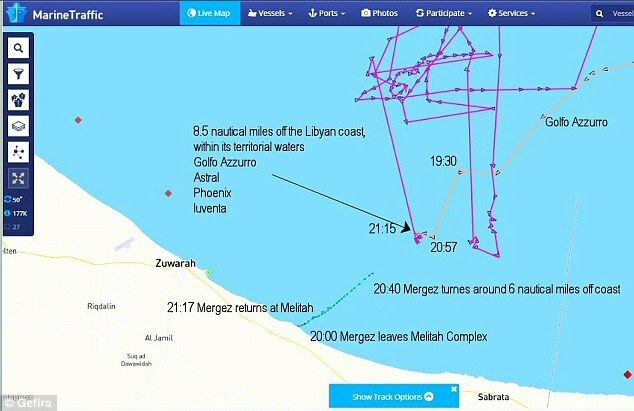 Just before their arrival an Italian tug boat, the Megrez, stationed on the Libyan coast, sailed six miles into open sea in the direction of the rescue point and then returned to port without stopping. The whole trip is recorded by Satellite AIS (Automatic Identification System). 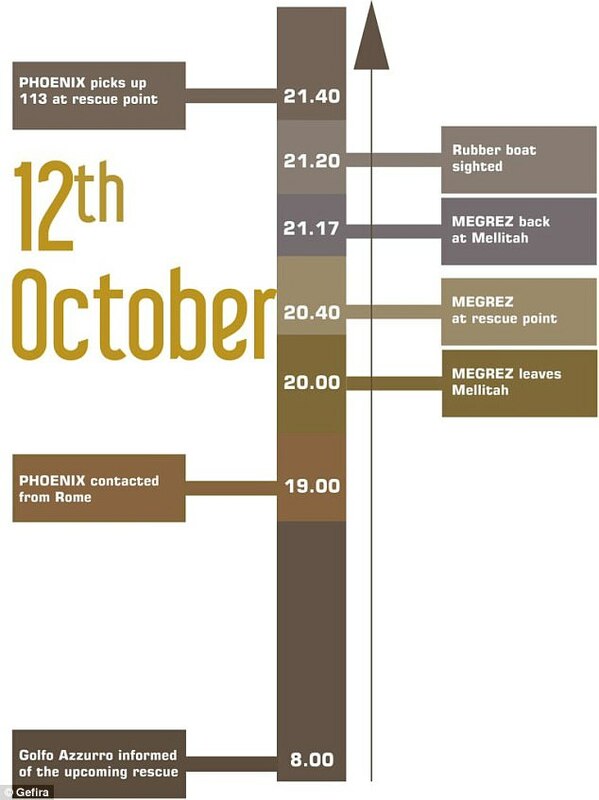 Forty minutes after the Megrez turned around, the Phoenix spotted a boat with migrants. The safe port of Zarish in Tunisia is just 60 nautical miles from the ‘rescue’ area. 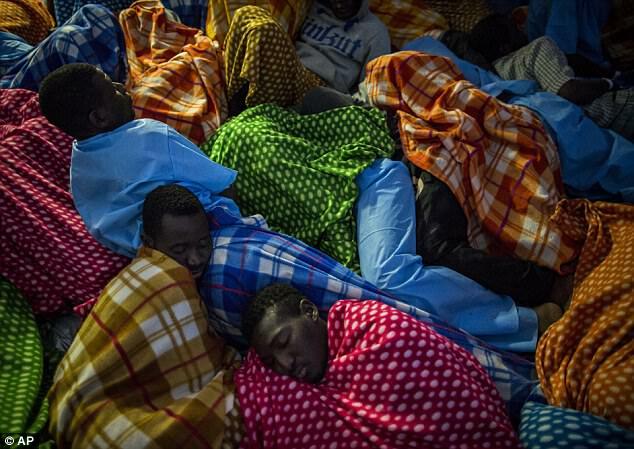 Instead, the NGO ferries took the migrants 275 nautical miles to Italy. We contacted the NGO responsible for the Golfo Azzurro. They do not recognise this interpretation of events. They say they have reviewed their own data and can only conclude the allegations are simply untrue. ‘There are two flaws we identify: The call at 8am was for a different case. Often, we got more than one call per day. In fact, the Italian coastguard did not call us at all that morning. We heard radio chatter, meaning that we were listening to other rescue cases happening in the area. ‘Seventeen people drowned that day, including a three-year-old child. We see it as our duty to help people in need and to rescue lives. It is not up to us to provide answers to systems that don’t function effectively. We are there to save lives. 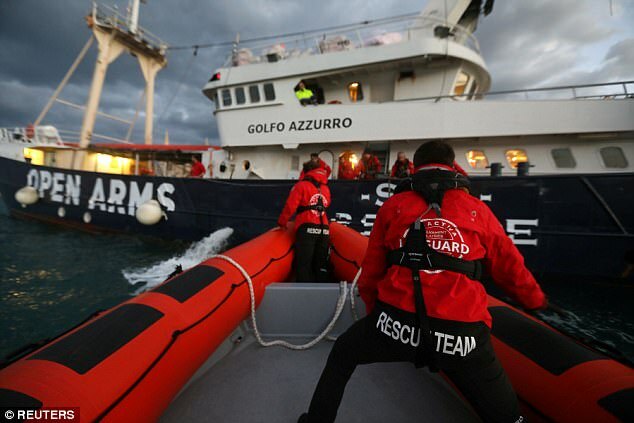 MailOnline contacted the Italian Coastguard for their views but have yet to receive a response. But clear facts remain. The number of rescue boats is proliferating. And they are collecting migrants from Libyan waters without a prior distress call or rescue location being given. Estimated operating costs for each vessel are upwards of £10,000 a day, allegedly provided by donations alone. The funding certainly makes for interesting reading. 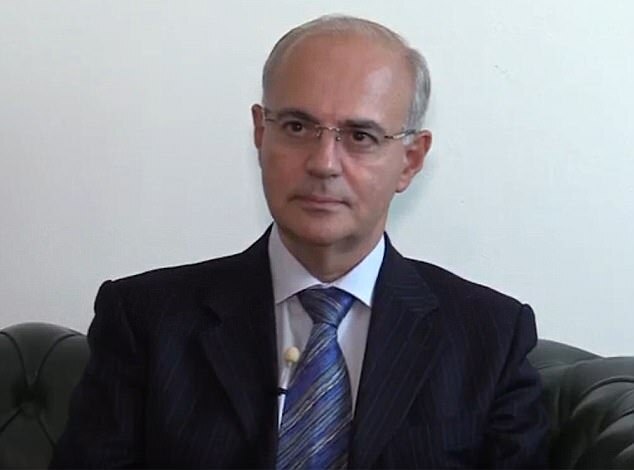 Investigations by the US human rights investigator and lawyer William Craddick claim that several of those chartering rescue boats are linked to the financial patronage of those who support mass migration and free movement. The NGOs running the rescue boats are outraged by the insinuation they are in fact a ferry service. Is it just me? Or does 11.5 nautical miles off shore sound like this is a Libyan not an Italian or European issue? 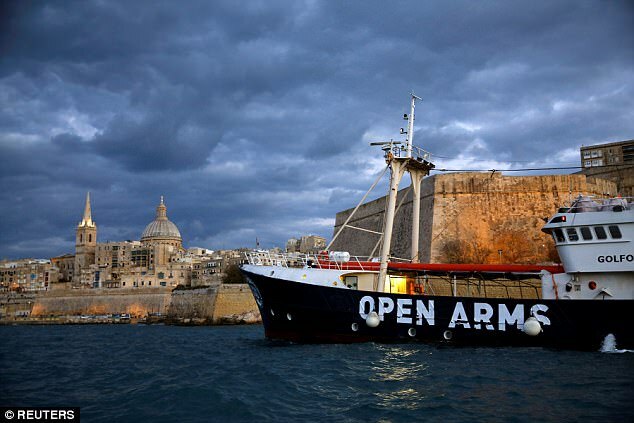 The Migrant Offshore Aid Station which runs the Phoenix ship, said: ‘The beginning of MOAS’ search and rescue missions in the summer period corresponds to the improvement of weather conditions, as does the increase in the number of crossings. Frontex disagree. They say as the number of rescue boats rises, so do the deaths at sea. We have all seen the pictures of those who are lost along the way. Mainly women and children. Disposable humans. To the human traffickers these bodies are simply natural wastage, human collateral in the massive business of importing people at high volume. At best the presence of the NGO boats so aggressively close to the North African coasts mean the smugglers and their cargoes know the journeys are likely to be much less dangerous and significantly shorter before they are picked up at sea. More time to return to port and pick up a new load ready for their new life in Europe. At worst they have become an active – if well-intentioned – part of the refugee smuggling industry. Just another link in the travel industry that takes people all the way from Syria and Sub-Sahara Africa to the refugee camps of Calais, and beyond. They may mean well. But the road to hell is paved with good intentions and I believe these so-called rescuers are complicit in the deaths of refugees who might otherwise have lived. Our MailOnline source at Operation Sophia shares my view. He says: ‘There have been unintended consequences from the NGOs actions. ‘Because the people smugglers know that the migrants will be picked they are put in boats in terrible conditions. They used to have enough fuel to make the journey across the sea but now they just have enough to get into international waters. 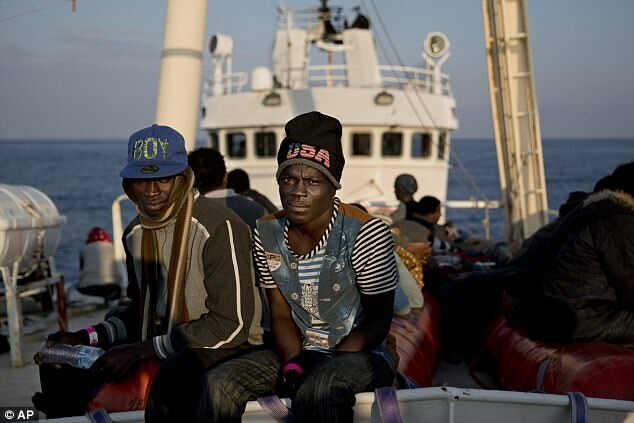 ‘The migrants are packed on the boats in huge numbers. People are beaten and even forced on to the boats at gun point when they refuse to get on them because they are in such a bad state. Clearly something is going horribly wrong. And we should be under no illusion about the type of passenger arriving into Italy. Do not have your head turned by the pictures of a woman or drowned, discarded child. 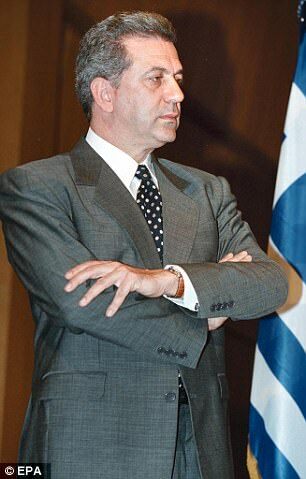 Dimitris Avramopoulos, the EU commissioner charged with improving the effectiveness of the border agency Frontex, says up to 80% of migrants arriving in Italy have no right to asylum, many are economic refugees from as far away as Bangladesh. Many have been radicalised in the prisons and camps in Africa where they are ‘hired’ either illegally or off the books. Research from the British think tank Quilliam shows that, while some refugees have to pay $560 towards the Mediterranean passage costs, ISIS offers potential recruits up to $1,000 to join the organisation if they make the crossing. Humanitarian? Not very. Clearly there are global powers at play. But at a national level, this is not a game. The recent explosion of illegal refugees into southern Italy is catastrophic. 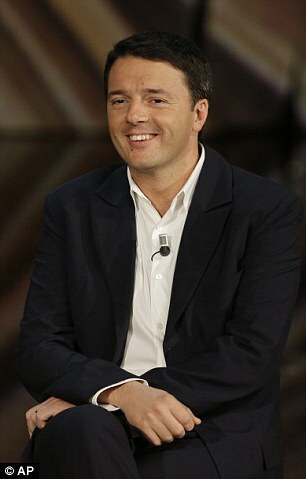 Last October Italian Prime Minister Matteo Renzi warned that Italy would not survive another year of mass immigration like 2016. ‘We have six months. Either we block the influx by 2017 or Italy will not handle another year like the past year,’ he announced on national television. Today, the six months Renzi warned about will be up. Italy will not survive this. I do not believe Europe will, either — certainly not as the countries they have been for centuries. 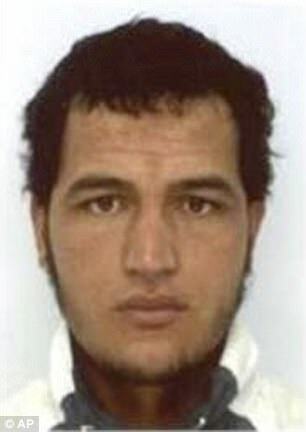 The monster that drove a truck into the Christmas market in Berlin arrived into the EU via boat to Italy. My fear is that these NGO ‘ferry services’ will ensure many more monsters to come.